Climate change and adaptation measures to increase resilience and reduce risk are now at the forefront. Monitoring and evaluation of adaptation projects can help to link and better connect the end user community and donors for successful outcomes. CLIMsystems with its international experience on climate science and community development bridges the gap between decision makers at all levels. Adaptation to climate change is mushrooming into a new development and poverty reduction paradigm. The much heralded Green Climate Fund, the private sector initiatives such as those advocated by the Global Adaptation Institute and governments charged with managing the inflow of capital portend to a new and underserviced area – monitoring and evaluation of climate change adaptation projects. As Peter Urich the Managing Director of CLIMsystems notes the donor community is clamoring for expertise to assist them in monitoring the complexities of climate adaptation projects that integrate science, policy, the environment and social systems. To answer the need CLIMsystems which leads the world in the development of user friendly and scientifically robust climate risk and adaptation assessment software has established an integrated team of leading professionals with the mix of skills and experience to effectively and efficiently monitor and evaluate climate change adaptation projects. Urich says “this is a growing market our partners such as CH2M Hill and our global group of climate change Associates wish to play a pivotal role in assisting the development community in meeting its obligations through well-conceived, designed and implemented adaptation projects”. In an interview Gareth Johnson of Future Ready PTY in Australia expressed his views. He noted that “efforts in responding to climate change have proven complex and often difficult and are likely to become more so. The green side of climate response has encountered many challenges in its responses so far and efforts by donors in responding to climate impacts and reducing vulnerability are fraught with more complexity”. He went further to say that “too often the problems are seen from afar as a technical project requiring a technical fix such as a sea-wall or new crop varietal, not one with social, environmental, economic and cultural dimensions”. Monitoring and evaluation will ensure local needs are better met through an extra check and balance often missing from donor projects. Investment grade decision making needs investment grade data and process to support good decisions. 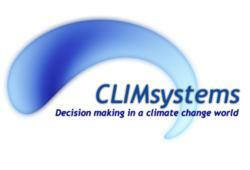 Johnson said that “local networks and knowledge are equally critical and I therefore welcome CLIMsystems initiative. CLIMsystems has local, regional and global adaptation experience backed by sector leading technology that is invaluable for decision makers. I look forward to working with CLIMsystems and aid donor organisations to enhance adaptation responses and better meet mutual needs”.